PLEASE USE THE "CONTACT US" PAGE. Additionally, from time to time, an adult may be available for a loving family and/or we MAY have puppies towards the end of 2019. RinChen Tibetan Terrier puppies are home-raised with love and attention from people of all ages and other pets to be thoughtfully placed with loving, responsible families with whom we maintain relationships for the life of their new companion. As puppies, they have a healthy lifestyle with time to play & exercise & explore outdoors and relax indoors, socialize, and give & receive affection. 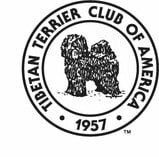 Parents are carefully bred & selected AKC champion 4th & 5th generation Rinchen Tibetan Terriers. All parents are extensively health tested, with Orthopedic Foundation for Animals certifications and additional European and/or Canadian health certifications in keeping with current research against heritable diseases. All puppies are veterinarian examined & hearing certified and microchipped. ​ AKC ownership registration and ReUnite microchip registration is taken care of by RinChen on the family's behalf . ​To learn more, please visit our Breeder's Philosophy page. Our home-bred 5th Generation AKC Champion, Rinchen's Bridge Over Troubled Water, distinguished himself with additional Best Non-Sporting Group Puppy awards this year. A new baby... tucking in for first meal. All our Tibetans are extensively health tested.